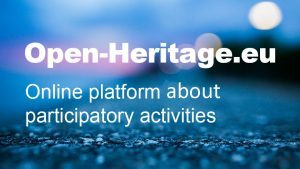 The scope of the international workshop on Resilient Cultural Heritage is to provide feedback on the preliminary findings about ’The REACH proposal for a resilient European Cultural Heritage’. As a preparatory action, the pilot on Small Towns Heritage organised on 14-16 November the workshop titled "Resilience of Heritage in Resilient Cities". This event was the first of a series of encounters organised by the REACH pilots, aiming to contribute to the wider workshop on Resilient Cultural Heritage, that is planned to take place in 2020. The workshop will take place in Prague. The participants will investigate resilience strategies for CH based on the REACH proposal before its finalisation. Relevant stakeholders and associate partners will be invited to discuss the accumulated experience of REACH on this topic.